Whenever we go home to New Jersey for a visit we stop at Italian pastry shops for cannolis and cinnamon savoiardi (ladyfingers), which are my daughter’s favorite. Despite their exotic name, they are really just a simple piped, cake-like cookie. But adding cinnamon oil to the batter takes these cookies to a whole new level. This recipe is adapted from Nick Malgieri’s wonderful book Cookies Unlimited. The original recipe instructions call for piping the cookies onto parchment-lined baking sheets, but I prefer to use lightly sprayed ladyfinger molds, such as one that I bought in Europe years ago used for those in the photo below. Preheat oven to 350 degrees. Line 2 baking sheets with parchment paper or lightly spray 2 ladyfinger molds, wiping out the excess. Set aside. In a mixer bowl combine egg yolks with vanilla extract, cinnamon oil, and 1/4 cup of the vanilla sugar. Use the whip attachment on your mixer to whip the egg yolk mixture until thick and lemon colored – about 3 minutes. Remove bowl from mixer and set aside. In a separate mixing bowl combine egg whites with salt. Beat using a clean and dry whip attachment until they are just beginning to hold their shape. Add remaining 1/4 cup vanilla sugar in a stream and beat until the egg whites hold stiff peaks. Sift the cake flour onto the egg yolk mixture a little at a time, folding it in with a spatula. Once all the flour is mixed into the yolks and the mixture is thick, fold a little of the beaten egg whites into the egg mixture to lighten it. Continue folding in the remaining egg whites until they are incorporated into the batter. You should have a light fluffy batter. 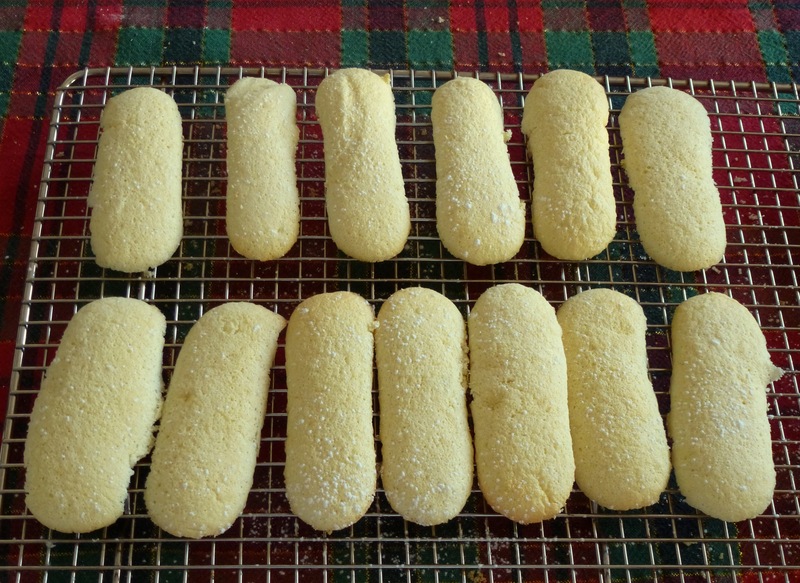 Pipe the batter onto the parchment into 3-inch long fingers, or spoon the batter to almost fill prepared ladyfinger molds. Bake cookies for 7-8 minutes or until they are firm and light golden. Remove baking sheet to a rack. Let cookies sit on the baking sheets or molds for 2 minutes. Use a spatula to gently lift cookies off parchment paper or out of their molds. Cool on a rack. Sprinkle lightly with powdered sugar before serving. Makes 40 cookies. This entry was posted in Christmas, Cookies, Dairy-free, Desserts, Easter. Bookmark the permalink.